ES - Why 5 GHz Wi-Fi gives out much less RF radiation than 2.4? Why 5 GHz Wi-Fi gives out much less RF radiation than 2.4? I have here with me two EMF meters, the Acoustimeter and the Cornet ED88TPlus. I use a VR900 WiFi router in one of the bedrooms. In my room the iPAD uses Ethernet with an adapter. The router is broadcasting WiFi 24/7 and it can do this with 2.4 and 5 GHz. We all know 5 GHz is better, for being faster, but the range in which the signal can reach is more limited than 2.4. 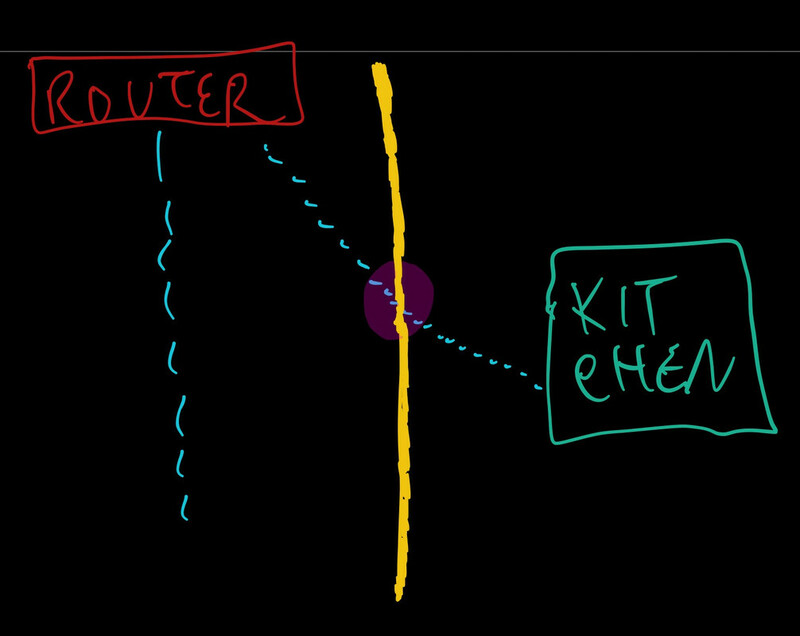 In other words the user needs to be closer to the router, while 2.4 can penetrate greater distances. 5 GHz is also not prone to neighbors interference (people using the same WiFi router channel). However when we talk about range in which a signal can reach, we are also talking about RF radiation. For example, in my apartment there are two specific locations which can be called “dead zones”, where the signal is weaker due to obstacles such as very thick walls in the corridors. The internet speed is slower or I can’t even establish a connection in them. In one of the 3 bedrooms (there are 3 in my house) the RF radiation measured by these meters is lower. Also in the kitchen this happens. They are lower than bedrooms 1 (3-4 meters from the router), 2 (where the router is), the bathrooms (close to the router) and the living room, next to bedroom 1. What these two locations (dead zones) have in common is the fact the signal needs to reach them in diagonal, not in a straight line path. While my bedroom is in a straight path and receives the WiFi signal a lot more easier. First, the transmit power. Most routers come with high by default. I changed to Low and that made a great deal of difference. Then there’s Beacon Interval. By default is 100, I changed to 1000. Third: Alasdair Philips, which designed the Acoustimeter, once said that broadcasting the SSID would give out more RF radiation. He said we could easily hide and then add the SSID network name manually. And we really need to do this once, after that (and inserting the password) it’s saved and remembered in the device. That’s a good idea, but so far I haven’t been able to prove there’s any impact in terms of less RF radiation. At least I didn’t notice in the meters. About 5 GHz, one strange thing is the fact it doesn’t give in any way the same RF radiation from 2.4. In fact only when we approach both Cornet and Acoustimeter close to the WiFi router is the moment the meter picks up something. I even thought the router wasn’t turned on. 2.4 GHz broadcasting: high RF radiation anywhere. In the bedroom where the router is it can reach as high as 6 V/m. In my bedroom 3-4 meters away it might register 0.5 or 1 V/m. In the living room 0.5. In the bathroom (very close to the router, only a wall separates them) the levels are 2, 3 V/m. This is for 2.4 alone. Let’s pretend 5 GHz is not even enabled. And of course devices using 2.4 GHz for their WiFi will give out 2, 3 or as high as 6 V/m, depending how they are being used. 5 GHz enabled and 2.4 disabled: This is where things get interesting. In the bedroom where the router is: 2, 3 V/m from 1 meter (3 ft or less). After that distance the RF radiation is much, much lower, perhaps as low as 0.5 or less. In other words the Cornet and Acoustimeter treat 5 GHz as if it wasn’t even there, as if the router wasn’t even broadcasting anything! And in my apartment I can get a good signal from 5 GHz even in my living room, where the 120/10 Mbps internet can perhaps register in a Speedtest 90/10 from 7 meters (22 ft). Both 5 GHz and 2.4 use the same settings. Beacon interval is 1000 and transmit power for them is low. So if they were the same in terms of EMF pollution, or RF radiation, they would register the same in both meters. For example, in my bed, located a few meters from the room where the router is, when 2.4 GHz is on I can see in the visor 0.5 V/m easily. Of course, if I raise the meter, since the signal is stronger in higher places. But if 5 GHz is the only signal being broadcasted I believe it will be reduced from 0.5 to 0.2 or less, and this 0.2 is probably the neighbors. So, with all that said, what is my CURRENT CONCLUSION? 2.4 GHz is pervasive and wherever it is it can give out a lot more RF radiation. 5 GHz is the exact opposite and there’s only RF radiation when we are very, very close to the router. Please note I am not implying 5 GHz is harmless. Only that unless these meters do not pick up 5 GHz as they promise to do, this signal is probably less harmful. Any thoughts? Sorry for the long post, I just had to write all this stuff and share here because I couldn’t find a similar discussion anywhere. If the meters are reading right then I wonder what the Gigahertz one specific made for 5 GHz can tell about it. The fact the most known meters sold by this company can only go up to 3 GHz isn’t an indication it’s probably hard to read this correctly? Or 5 GHz is really like this? The difference was so massive between 2.4 and 5 GHz WiFi that I thought the meters were not reading correctly. Re: Why 5 GHz Wi-Fi gives out much less RF radiation than 2.4? Hmm, it seems like some people with ES complain about 5gz routers as being worse for their symptoms, although maybe they are complaining that there are now 2, or sometimes 4 transmitters when there used to be just one? I am not an expert in measuring 5ghz at all, but I'll tell you from my experience and what the sales rep from Gigahertz said. Meters are calibrated to a 'sweet spot'. They cannot measure such a huge range of frequencies reliably. The HF-32D from Gigahertz is a good example. You can be 4-5 meters away from a DECT phone and it will show ZERO,.. yes zero.. Is that true, absolutely not... there are still big amounts of radiation at that distance. With that, I was convinced I'm safe and I suffered years unknowingly, because the meter showed zero in many places that were not zero at all. So, if your laptop gets good signal, use something like Wifi Analyzer and let your laptop tell you what the strength in DB is!.. That's your best meter. Also since 5ghz has twice the amount of pulses than 2.4ghz, it should be roughly twice as bad if it's the pulsing that causes issues (a common theory). You're reducing beacon internal to reduce pulses. At 5ghz you have double the pulses in the signal compared to 2.4ghz. - In my apartment the VR900 wi-fi router is only using 5 Ghz. Settings have been changed to: beacon interval = 1000 and transmit power to LOW. These are the least harmful settings I could measure from it. Anything different than that will result in more RF radiation. I can also tell the signal will reach all locations of my apartment without any issue (some people might think reducing transmit power, for example, would cripple the signal - not true). In the living room which is 2 walls and METERS distant from the router I can still get good speed from the 5 Ghz router. Which contradicts the explanation that 5 Ghz is much more limited in terms of range than 2.4. I think this is true, despite that my router is good to a point the signal still gets where I need. - In the apartment next to mine (from my sister) there's another router: Archer C8. It only uses 2.4 Ghz, also with the same settings to reduce radiation. - Then there's neighbors wi-fi routers and whatever else in the surroundings that can influence the readings. - We all know the more distance we put between us and all EMF pollutants the less radiation we receive. This is also true for magnetic fields. The goal of my research was to find out if a) 5 Ghz is less harmful than 2.4 based on these EMF meter readings, and b) if it's the same in the end then why the meters read a lot less? Observation: I am aware that lower readings can still be harmful. Sensitive folks would complain at much lower levels (I don't have electromagnetic hypersensitivity, by the way). And I understand this explanation about a meter not showing anything from a certain distance, even though there's still RF radiation there. My point is that all devices I measured to this date influenced the readings, yet with 5 GHz wi-fi this is considerably different. If we considered a wi-fi signal to be "raining" (water) in our house, then a thin trickle of rain coming from the sky (and miles away) would be detected by those meters before it hits the ground! With 5 GHz it could be "raining" in our entire house (RF radiation) and they would still be showing an insignificant difference in the RF radiation readings, if any at all. That tells me at least these 2 meters are unreliable for this task, because they fail miserably to alert me the wi-fi signal is strong or that is being broadcasted. - Quick info: there are a few devices which don't work (connect) with 5 Ghz at all. The SSID (name of your network) will be invisible for them, and they will not be able to use the internet if only 5 Ghz is available. The Kindle Paperwhite (3rd gen, released in 2015) is one: I always leave in airplane mode, however when I want to browse the internet (or download a saved ebook in the Amazon cloud) I'll need to connect to the 2.4 Ghz. This device also can't use ethernet (as far as I know). My iPAD is always using ethernet + adapters. I also have one android TV box here that can only use 2.4 Ghz. In my opinion equipment that can only see 2.4 Ghz should be replaced when possible, since it's obvious it's not technologically well designed, due to this limitation. - 0.05 V/m when it's placed in my bed. This is in my bedroom, where there is no EMF pollution. The distance of this bed to the VR900 router is exactly 3.5 meters (11 feet). There's a wall in straight line path, after half that distance. If I raise the Cornet 1.3 meter (4 feet) above the bed the reading increases to 0.10 V/m. This isn't a precise number since there are areas in the same room where the reading can be higher. It is, on the other hand, a good indication of what we can expect. I also have the iPAD Pro 10.5 (256 GB, wifi+cell model). This device is not using a SIM card, so no 4G. - Right above the iPAD: at least 0.30 V/m. When I move close to where the antena (?) might be (in the iPAD), above the home button, it can reach as high as 0.7 V/m and then back to 0.3 while streaming. In the middle of the device I spotted 0.5, 0.6 V/m, for a second (peak value), then back to lower levels. Now let's look what the readings are in the bedroom where the 5 GHz router is located. - Distance from the router: 1.5 meter or 4.9 ft = at least 0.3 V/m. While the Cornet is placed in the bed. 1 meter (3 ft) facing the router: close to 0.4 V/m. The Cornet also shows lower values for frequency, such as 100, 200 MHz or even less. It's odd because when a DECT phone (wireless) is being used/turned on (mine has ECO Plus mode, meaning when it's turned off there's no RF radiation from the base) the Cornet shows a high number, close to 1900 Mhz. Then by the same logic shouldn't it display close to 5000 Mhz? When I place the Cornet in the bathroom which is next to the table where the router is I can get 1 V/m. However notice the distance from the signal is perhaps 50 cm (1.6 ft). At this distance I am practically shoving the EMF meter into the router. Let's see now how those numbers change for the same iPAD - if it is connected to 2.4 GHz. Cornet above the iPAD, with Youtube video playing: 1.3 to 2 V/m. Wait, wait, wait... with 5 Ghz it was down to 0.3 V/m! That's a 76% decrease in the readings! And what would happen if I approach the Cornet to the Archer C8, the router only using 2.4 Ghz? Distance: 1 meter/3 ft: frequency no less than 2300 Mhz and RF radiation of at least 1 V/m. That's no less than 2-3 times higher from what I saw with the 5 Ghz router (VR900). I don't need to check with Acoustimeter all of this because the end result will be THE SAME. The difference I noticed between both meters is that the Acoustimeter ALWAYS show higher numbers. For example, if the Cornet tells me it's 0.3 V/m the AM will likely display 0.6 or a similar number. Since two meters behave the same then the final conclusion is that 5 Ghz wi-fi in terms of signal is less harmful than 2.4 Ghz. At least in terms of how strong the signal is. - These meters can't do a good job showing 5 Ghz wi-fi. The most used Gigahertz meters (for RF) can't read 5 Ghz. 3.3 Ghz is the max they can detect, and we are talking about professional/expensive EMF meters. However Gigahertz also sells meters that can read 5 Ghz. What is odd about them is that they can only go from 2.4 to 6 Ghz. The HFW35C is one of them. Then there's the HFW59D which claims to go from 2.4 to 10.0 GHz. RF Frequecy range: 100MHz to 8GHz (RF meter), (-60dBm to +5dBm),(0.5uw/m2 to 1.8w/m2), (14mv/m to 26.2v/m). I thought these meters were defective or they were only good for reading up to 2.4 Ghz which is the frequency most devices use. I never had any Gigahertz meter, so I can't tell how the HFW35C (2.4 to 6 Ghz) and HFW59D (2.4 to 10 Ghz) would behave in my scenario... it would be interesting to find out, though. Take a look into the replies. They clarify a few more things. Below I reproduce what was my last message in it. I remembered a website that talks about electromagnetic hypersensitivity and evaluated EMF meters, called "seahorsecorral" - there's a message indicating what I suspect: both Cornet and Acoustimeter underestimate how powerful the 5 Ghz wi-fi signal really is. Quote: I don't see that as funny at all. Do not assume a weaker signal strength automatically results in degraded speeds. For example, if the receiving end only needs 3mV of signal strength to obtain full bandwidth/speed, getting 5mV will not improve those speeds. It is only when the signal strength drops below that necessary 3mV that speeds may suffer. That makes sense. One of the things I heard was that cell towers would not need to be so powerful if we didn't use 24/7 and only for more urgent/important calls. And at least with the 1st setting the RF radiation was reduced in later measurements. Alasdair Philips (which developed the Acoustimeter) suggested that hiding the wireless SSID would help, too, since it's another thing that is broadcasted 24/7, however I wasn't able to see any change in the readings. I don't doubt he is right, maybe it's hard to confirm with these meters. I was surprised to see lower readings in both of them, anyway. They were much lower in comparison to 2.4, it was so odd that I thought the meters were faulty or couldn't pick up 5 Ghz at all. For example, with the Cornet (and 2.4 Ghz) I got 1.3 to 2 V/m above the iPAD. This 2.4 was from the apartment next to mine (Archer C8 router, used by my sister). Then I switched to 5 Ghz (VR900 router, much closer): 0.3 V/m. That's a 76% decrease. It's so low that any person like me that does not understand the subject will think the iPAD isn't giving out any RF radiation. I suspected of a flaw (or deficiency) in the meters because most devices do not use 5 Ghz, and perhaps detecting 5 Ghz would only be done better by more expensive, professional models. These are the two of the most recommended, however a company called Gigahertz Solutions has very technical devices (I don't own anything from them). One thing that also caught my attention is that they don't have a meter (for RF) that has a range below 2.4 to 5 GHz. So 2 meters are required for detecting below 2.4 (or 3.3) and above 2.4/3.3. That tells me (somehow) it isn't exactly easy to develop a meter that can go through all these frequencies. The thing I really like about this meter is that its a true directional meter. Which means its useful for determining where RF radiation is coming from. This is a really important feature. Does that mean you can just point the meter in a certain direction to know what the radiation is in a particular location from that direction? Not exactly. RF radiation is reflected and reverberated in practically any environment. Outside in a rural environment if you point point the meter in different directions you should be able to pinpoint the source of RF radiation exposures. But sometimes this can be difficult to do if you are in an environment where there are metal and other reflective surfaces which cause the radiation to bounce round. This is particularly true indoors. Nevertheless this meter does have true directional capability which few meters in this price range can offer. Then there's the fact the Acoustimeter numbers are always higher than Cornet's. 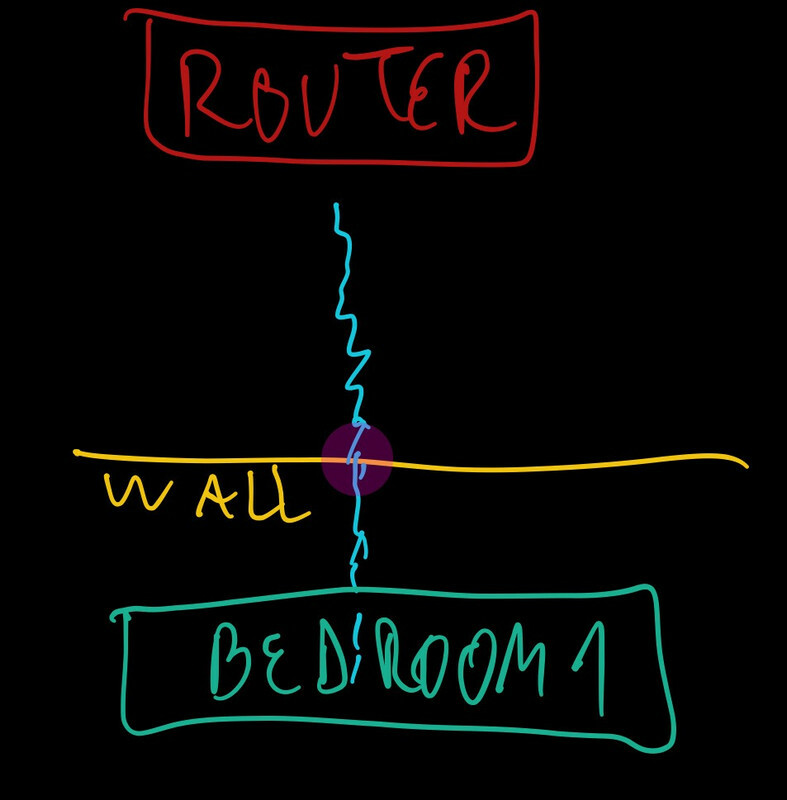 Quote: If that were my house, I would try to put the router near the center of the house instead of that corner. At least next (and as high as possible) to that first wall towards the LR. I know about this, it's just that I removed the router from my bedroom, in which it was practically in the center of the house. I placed in the room next to mine, so it's a few more meters distant from me. Since the RF radiation is reduced with distance, this goal was achieved (before it was much closer - in my desk). As a result the only dead zone in my apartment is indeed the kichen. I checked a few minutes ago and discovered the 5 Ghz wi-fi signal DIES completely once I enter there. All other locations are fine. In the speedtest (I have 120/10 Mbps) the result is 93/10, which is great. Go to 1 minute and you'll see the speedtest failing, that's when I entered the kitchen. To fix dead zones people also buy wi-fi repeaters, what I also avoid because the goal is to reduce EMF. And there's no need for me to use internet there. I walk in this apartment, starting right in the aforementioned kitchen. You'll see once I leave there what kind of obstacles the router has to "defeat" to deliver the signal. The location of the router is inside the bedroom at 0:50. It's called: "How Does WIFI Signal Penetrate Walls? (Illustration + Analogy)". You said to place in a higher position, and in higher places these EMF meters also display higher numbers. When the routers have the wi-fi turned off I still pick RF radiation from the neighbors. So it's picking signals from everywhere. One comment about Gigahertz Solutions meters. I have not personally reviewed the HF meters, as they are quite expensive and out of the range of most people who I aim to help here. Other top experts do recommend them as superior for detecting the full spectrum of microwaves and high frequencies, more fully than any of the meters I prefer. My experience agrees that the Cornet, Acoustimeter, etc, do all have incomplete coverage of the spectrum range they advertise for. Meaning the measurements may be lower than actual power levels in the air. Despite this, I consider the meters I recommend to still be the best balance in detecting and measuring. Just remember if you want perfect calibrated numbers, you must pay much more. The only other company besides Gigahertz Solutions that makes the top rated meters, is Aaronia. According to experts. Who also agree that Aaronia meters are too noisy for electro-sensitive people. So again, it becomes obvious why I do not recommend Aaronia.